WASHINGTON (CNS) — The president who admonished Americans to “Ask not what your country can do for you. Ask what you can do for your country,” didn’t live to see how it played out, but there are plenty of people trying to keep his vision alive. That starts with President John F. Kennedy’s own relatives — many of whom appear to treat public service as the family business — and extends to entire generations of people who have been brought up with the expectation that they have an obligation to make the world a better place. Kennedy’s inaugural address in 1961 launched a new approach to public service, helped along by his creation of the Peace Corps, VISTA and other organizations that provided an institutionalized way to volunteer in developing countries and among the poor and disadvantaged in the U.S.
“We are just now realizing the full fruits of that call,” said Mathew Johnson, an associate professor of sociology at Siena College in New York, and director of its VISTA program (Volunteers in Service to America, a domestic anti-poverty program now paired with AmeriCorps.). Today’s young adults were brought up by baby-boomers who were the first to step up to Kennedy’s call to service, he told Catholic News Service in an Oct. 18 phone interview. The children of the first generation of Peace Corps and VISTA volunteers have reached college age or their early career years having lived with the expectation that service is a part of everyday life, he said. Public and private schools now routinely require public service, too. That’s created a fundamental shift in how society thinks of service, he suggested. The National Assessment on Service and Community Engagement, an online survey conducted by Siena of students at more than 50 colleges, found that close to 90 percent of entering freshmen have done public service, Johnson said. 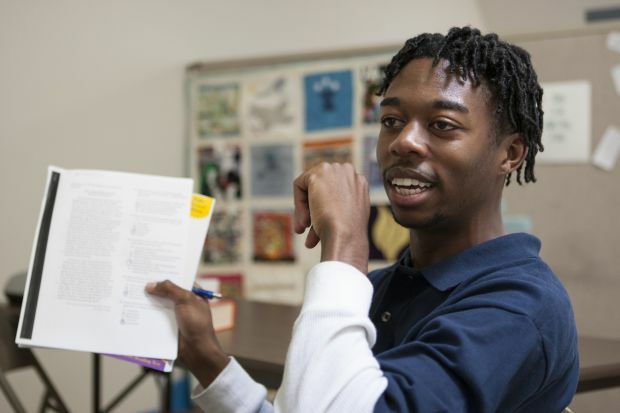 That typically drops off during college, “and they’re not happy about it,” Johnson said the survey found, which suggests that helping others becomes a way of life that people want to continue. Another survey by Center for Applied Research in the Apostolate at Georgetown University, commissioned for the Catholic Volunteer Network, found that nearly all former volunteers in the study said their service made them a better person, that they enjoyed it and it helped them become who they are today. The study, scheduled for full release in November, also found nearly all former volunteers with ties to the network report being happy with their lives overall. Johnson said the experience of public service since the 1960s constitutes a significant institutional investment, spreading through all levels of society through public entities, public-private partnerships and religious institutions. 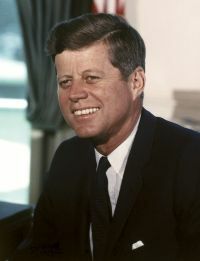 Jesuit Father William R. Byron, a professor of business and society at St. Joseph’s University in Philadelphia, said Kennedy’s call caught on with students who wanted to make the world a better place and with a wave of returned veterans of World War II who understood the value of service in the military context and wanted to keep doing it. With the benefit of college educations they could get because of the G.I. Bill, veterans were primed to continue in public service, said La Salle Brother Gerald Molyneaux, a communications professor at LaSalle University, also in Philadelphia, who has researched and written about the founding of the Peace Corps. Many veterans were tapped to run the new government service programs, he said, while the next generation, those in college and younger, stepped into the on-the-ground volunteer jobs. He said the Peace Corps, in particular, was a combination of altruism and Cold War politics. It appealed both to people who wanted to make the world a better place and those who “liked the idea of young Americans carrying the flag to the developing world” in competition with the Soviet Union as it sought influence around the world through development aid. The lasting effects of the call to “ask what you can do for your country” may be exemplified by Kennedy’s own family. The children of the president and his siblings, and now their children, work and volunteer in a wide assortment of service. Many have started charitable organizations, serve on boards of nonprofits and work to bring attention to diseases, environmental problems, poverty and other issues. Several have followed in the political footsteps of the president and his brothers, Robert and Ted, who both served in the U.S. Senate and ran for president. — Caroline Kennedy, the only surviving child of the president and Jackie Kennedy, was confirmed by the Senate Oct. 16 as ambassador to Japan, following the diplomatic path of her grandfather, Joseph Kennedy, who was ambassador to Great Britain. She also has been president of the Kennedy Library Foundation and been active in the American Ballet Theatre and the NAACP Legal Defense and Educational Fund. — The 11 children of Robert and Ethel Kennedy, nine of whom survive, include Kathleen Townsend, the former lieutenant governor of Maryland; Joseph Patrick, a former member of Congress and founder of Citizens Energy Corp., a nonprofit, low-cost energy company; Kerry, an activist with the Robert F. Kennedy Center for Justice and Human Rights; and Christopher, the former president of the Merchandise Mart, a source of the Kennedy family wealth, who now heads a nonprofit he founded to bring affordable groceries to urban areas without supermarkets. The next generation includes Joe Kennedy III, son of the former congressman, who was elected last November to the U.S. House from Massachusetts. — The children of the late Eunice Kennedy and her husband, Sargent Shriver, who co-founded the Peace Corps, among other service organizations, include Robert, a former Santa Monica, Calif., elected official who has founded several philanthropic organizations dedicated to debt relief and foreign aid; Maria, a former journalist and estranged wife of former California Gov. Arnold Schwarzenegger, whose website lists more than a dozen causes she supports, including those related to Alzheimer’s research and education, microlending, poverty law and Special Olympics; Timothy, chairman of Special Olympics; Mark, a former Maryland legislator and a senior vice president at Save the Children; and Anthony, who founded and heads Best Buddies International, which supports people with intellectual and developmental disabilities. Historian Robert Dallek, with Stanford University’s Washington program, told CNS that legacy is part of the reason the general public is still inspired by the Kennedy family. Other political families, including the Bushes, the Roosevelts, going back to the Adamses (presidents John and John Quincy), have had dynasties of service, but the Kennedys still remain highly visible, Dallek said.